In the last couple of decades, we have been hearing more about the co-existence of chronic bronchitis and emphysema and the serious long term and sometimes fatal effects of these illnesses. The old adage that ‘smoking cigarettes is bad for your health’ is one that we all know, and sadly many don’t take seriously until there is no choice. While there are other causes that lead to COPD or Chronic Obstructive Pulmonary Disease, it cannot be argued that the number one offender is smoking. There are however other risk factors that will be discussed further in the article. In simplest definitions, COPD is inclusive of both emphysema and recurring bronchitis constricting the airwaves and making it extremely difficult to breathe. Bronchitis is caused by a recurrent cough where there is over production of mucus in the lungs, causing the airwaves to become constricted. Emphysema is when the lungs have become so damaged that the air space walls become destroyed. Because of the lack of air getting through the passages, a person with these conditions are more susceptible to serious pulmonary infections as well as other illnesses. They will often complain of feeling tired or lethargic, as well as having deep, productive coughing spells along with periods of being very nearly unable to breathe. This is especially true after exercise or during periods of extreme stress. In contrast to other conditions of the air passages (such as asthma), COPD as a rule worsens rather than improves with time. The sad thing is, many blow off the symptoms to ‘smoker’s cough’ or simply having a worse than normal cold. For thousands of people worldwide, that choice is a fatal one. The most important thing to remember if someone you know has COPD caused by smoking cigarettes – there is no need to constantly reiterate to them what caused their condition. Many end up being on oxygen which takes cigarettes out of the equation, and they are quite aware of what got them in this position. Of course, the obvious solution for many, many cases of COPD is to never have smoked in the first place, but to harp on that is not going to solve the issue at hand. As in all things, a little compassion goes a long way, and the important thing is to get diagnosed and take the steps to get better. The first step to that is to learn what the symptoms are. Obviously, the number one sign that a person might be suffering from COPD is a chronic, productive cough. When there is simply something in the lungs that needs excised, a cough or two will get rid of it. However, in chronic bronchitis, the cough may be producing mucus, but the air passages have become so narrowed that it does not rid the lungs and instead builds up. This keeps exacerbating the problem, and the person is perpetually trying to cough up a never ending production of mucus. Another symptom is a constant shortness of breath also known as dyspnea or ‘air hunger’. Chronic shortness of breath can occur over periods of weeks or even months. This can lead to acute exacerbation of the disease, which is when the ability to draw breath becomes so difficult that it becomes an emergency situation. This is often triggered by a bacterial infection. Rattling of the lungs, also known as rhonci, is yet another symptom of COPD. This is when the breathing has a ‘rattling’ sound similar to snoring, that is constantly present. If the flare-up is bad, it can cause a bluish discoloration to the lips. 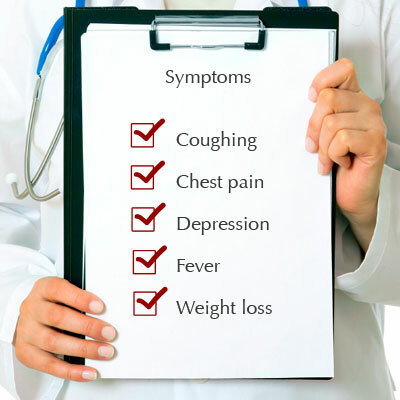 If these symptoms are present, and medical attention is sought, one of the first things that will be done are pulmonary function tests. This will be to see how far the condition has progressed and if it is reversing or getting better as time goes on. If the condition gets progressively worse, with no signs of significant improvement, treatment for COPD is recommended. While it is true that the number one cause is cigarette smoking, there are also other risk factors which have to be taken into consideration. After all, you don’t want to assume that just because you don’t smoke cigarettes that there is no risk of having this disease. Who Is At Higher Risk for COPD? COPD was often referred to as ‘smoker’s cough’ because many of its sufferers are also smokers. The numbers are high – almost 90% – and the longer a person smokes, the more risk they put themselves for COPD. Smoking cigarettes has long been known to worsen pre-existing lung conditions, but COPD is thought by many in the medical field to actually be caused by smoking over a period of years. The high concentration of the many free radicals that are in tobacco smoke cause the air sacs to become damaged, and the overproduction of mucus to counteract the irritants compounds the problem. While there is still long term research being conducted, there are indications that people living in urban areas where there is a lot of traffic congestion and factory smoke are more susceptible to contracting COPD than those who live in the country. There are significantly less cases from air pollution as well as occupational hazards (such as coal mining) than cigarettes, however the environment is a very real factor in cases of COPD, especially in non-smokers. Genetics is another factor in cases of COPD, and it does once again come back to smoking. Quite simply, not everyone who smokes cigarettes gets this condition, and it is thought that there are genetic deficiencies which make the lungs more susceptible to the effects of tobacco smoke. Studies have shown that if the body makes an insufficient amount of the protein alpha 1 antitrypsin due to a genetic condition, it is possible that the lungs are more vulnerable to the effects of tobacco smoke. In the last ten years, there have been more treatments made available for COPD. Obviously, if smoking is the issue, then it is essential to quit. Although COPD is a progressive disease, the flare-ups can be reduced with smoking cessation. There are also several medications that are now made for the treatment of recurring symptoms from chronic bronchitis and emphysema. Bronchodilators are most often used in the beginning, which act as a quick relief to narrowed air passages. Anticholinergic bronchodilaters relax the air passages, giving way for more ease in drawing breath. They come in the form of aerosol containers or ‘puffers’, Atrovent being one of the most widely prescribed. Other types of treatment are antibiotics for bacterial infections that can result with a flare-up as well as oral bronchodilater therapy such as theophylline. Less often, inhaled corticosteroids, most often used for asthma treatment, have been somewhat effective for COPD. Since there are side effects with any kind of steroid, this type of treatment is reserved for when regular bronchodilaters are not being effective. Oxygen maintenance is often used, especially in advanced cases of COPD. This is when oxygen is administered in metered doses from one of three devices – oxygen concentrator, liquid system or a cylinder. This is done either on a constant basis or as needed. Some people only need oxygen when they are actively exercising, while others need more full-time maintenance. As with many long-term illnesses, COPD is something that is treated rather than cured. Early diagnosis can lead to effective treatment that will delay the disease from going any further and if caught soon enough, can even reverse some of the damage done. Pay attention to any symptoms that include a deep, productive cough, periods of exhaustion from simple exercise, difficulty in taking a deep breath, and constant wheezing or ‘rattling’ in the lungs, most especially if you are a smoker. COPD has the potential to not only take away the quality of your lifestyle, but also to take life – at any age. This article is dedicated to the memory of Karen Witusik-Morfu, who sadly passed away in October of 2011 from a pulmonary infection stemming from COPD just a few days shy of her 39th birthday. She left behind her husband and two beautiful children along with many family and friends who cherished her. Please, take heed of any symptoms and get medical attention. Not later – now. This article is great! Written perfectly as usual by my friend Angela Sangster and for our mutual friend Karen, who died October 19th of what is also known as ‘the silent killer’. She just thought she had a recurring cough and cold. Little did she know that this was killing her. I am a smoker, but have cut down considerably since Karen’s death. I was on approx 25 a day, but i’m now down to about 15 a day. I want to stop asap.